CES 2011 is literally hours away, and already leaks and rumours are starting to pour forth from the Consumer Electronics industry’s biggest trade show of the year. 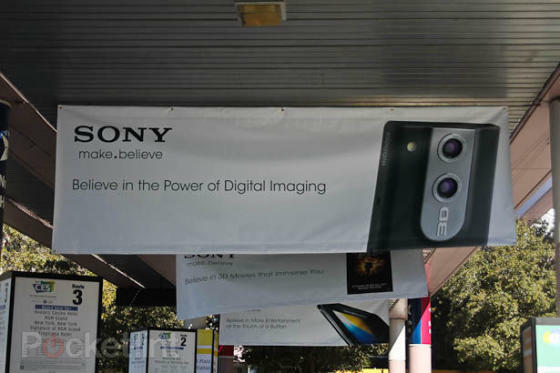 First to break is from Sony, who’s been busy putting up posters around the place that reveal all manner of gadgety goodness. This one, for example, shows off a new 3D Sony Bloggie camcorder with two lenses, which hints that 3D is going to be just as big at this year’s CES as it was as last year’s. The only thing we know about this new Bloggie is that its cameras use f2.8 lenses with auto focus, and that it’ll be called the Sony Bloggie 3D MHS-FS3. Finally, there’s also a budget Bloggie (a Budgie, perhaps?!) with a 5.1 megapixel still cam and 4GB memory. This is just a teaser of what’s to come at CES though. It all starts in less than 20 hours time, and we’ll cover as much of it as is humanly possible, so stay tuned!